Provides a shield of active EGCG that remains active more than 4 hours. Active EGCG: lethal to viruses, gentle to skin. No other sanitizer contains this patented compound. Recent research publication shows ProtecTeaV formulation is 1000 Times more effective than commonly used hand sanitizers against polio virus, the most difficult virus to eradicate (Zhang et al, 2016*). 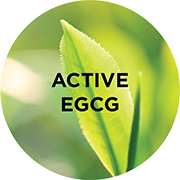 Patented EGCG compound derived from a green tea polyphenol. Provides an extra barrier of protection against viral infections, such as NOROVIRUS, FLU VIRUS, HERPES VIRUS, HPV, ADENOVIRUS, ADENOVIRUS, and RHINOVIRUS, many are resistant to alcohol. Recently received NIH award to continue studies of EGCG as a sanitizing agent. Utilized at University clinics and other healthcare facilities as the only sanitizer choice. The ProtecTeaV formula moisturizes, rejuvenates, and protects skin from harmful environmental factors. ProtecTeaV is a highly advanced, new generation of sanitizer that provides a protective shield of active EGCG that remains active on surfaces more than 4 hours. 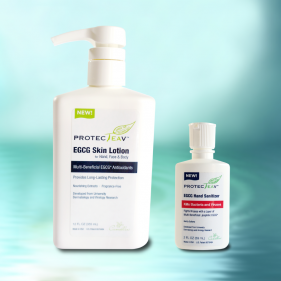 Active EGCG is lethal to viruses and gentle to skin. 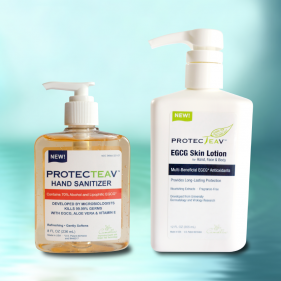 The ProtecTeaV formula utilizes a unique, patented green tea EGCG technology and showed 1000 times more effectiveness against Poliovirus than traditional sanitizers. Green tea is made from the leaves of the tea plant, which contains a unique group of compounds called catechins or green tea polyphenols. EGCG is the predominant polyphenol in green tea. Studies in a number of research journals show us that EGCG protects human cells from infection of flu, herpes, norovirus, hepatitis B and C viruses, human papilloma virus, HIV, even Ebola, according to recently published antiviral research by the U.S. Army Medical Research Institute of Infectious Diseases. The ProtecTeaV formula contains nourishing green tea antioxidants, aloe vera, and vitamin E that moisturizes, rejuvenates, and protects skin from harmful environmental factors. The natural formulation is gentile to skin and safe for all ages, as it’s FREE of parabens, dyes, artificial colors, or fragrances.